The adult is a stout (1.2-2.4″ long) brownish black beetle with a characteristic horn projecting from the head in both males and females. The larval grub is sluggish, white, ‘C’ shaped (2.4-4″ long or more), and crawls on its side. Larva have a rough head capsule that is large compared to its body. 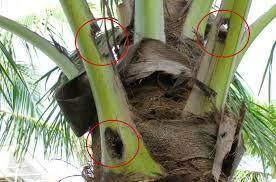 This pest can also be identified by the damage it inflicts on coconut palms. Adults fly at night and chew into the emerging fronds of coconut palms to feed on sap, creating holes in the top part of the palm, and killing the tree if it eats into the meristem (living/growing part of the tree). These holes are very noticeable once the frond emerges, with ‘V’-shaped cuts and holes in the midrib. Once a coconut palm dies, eggs are laid and the larva/grub can be found. The rhinoceros beetle is considered a major pest of coconut palms (Cocos nucifera) and African oil palm (Elaeis guineensis). 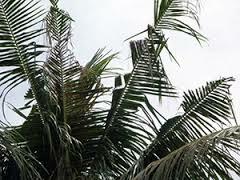 It can be also found in betelnut (Areca catchu), Pandanus species, banana, pineapple, and sugarcane. Adults damage living palms, either killing the tree due to direct damage, or opening up the tree to fatal damage from other insects or pathogens. On Pacific Islands with no natural enemies of this beetle, the damage can be extreme. In Palau, where the beetle first invaded in 1942, the coconut palm was eradicated entirely on some islands, with overall mortality across the archipelago reaching 50%. The rhinoceros beetle is native to Africa, China, Myanmar/India, and Southeast Asia and has been introduced to several Pacific Islands including Tonga, Samoa, Palau, Fiji, and Guam. First found on Guam in the Tumon Bay area in September of 2007, by early 2012, this pest had spread to all urban/suburban areas, including military housing areas (Anderson AFB housing). It is spread in infested yard waste and compost, as well as in rotting breadfruit/banana used for earth ovens in Samoa. Interisland transport of goods and people may account for long distance movement of this pest. It was found in Hawaii in 2013 at the Joint Base Pearl Harbor-Hickam during a routine survey by the Hawaii Department of Agriculture (HDOA) and the University of Hawaii-Hilo. If you see this beetle anywhere in Hawaii- call 643-PEST or report it online! Oriental flower beetle (Protaetia orientalis, P. fusca): The oriental flower beetle is a type of Asian scarab beetle that is a non-native pest that looks very much like the coconut rhinoceros. They feed on flower pollen and nectar, sap, and damaged fruit from a variety of plants and have been established on Oʻahu since 2002. The adult OFB are smaller (<1”) than CRB, do not have a horn, and have white spots on its back. OFB larvae are <2” long, have a head capsule that is smaller compared with rest of body, the head capsule is smooth (not hairy, like the CRB), and on the underside, near posterior end, a line is present. The two species’ larvae act differently when they move about. When laid out on a flat surface, the oriental flower beetle larva will crawl on its back, while the coconut rhinoceros beetle larva will crawl on its side. 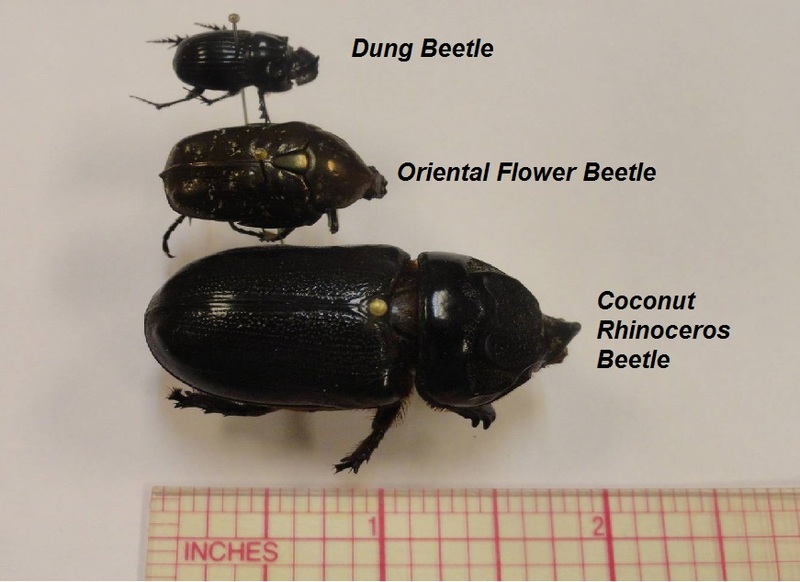 This method for differentiating the two species is somewhat subjective, so a specimen should be submitted to guarantee that it is not the coconut rhinoceros beetle.